A good night out, but patience and perseverance are a must! "A good night out, but patience and perseverance are a must! " Each time I visit the Cuban Bar I order at least two different drinks from the menu that they can’t make due to lack of ingredients, which becomes mildly irritating after a while. The food seems to have got progressively worse over the course of the last year, not to mention the service. I find myself questioning why I still go there, and it’s because it’s the only late opening cocktail venue I know of in Camden. Last time I was here I decided I needed to have a long break. My sun dried tomatoes, goat’s cheese and olives salad was a bowl of olives and some scrapes of cheese that looked like they had rubbed onto the dish by accident, with one sun dried tomato. I was about to complain but thought better of attempting to get any sense out of the waitress who took so long to take our order it appeared she was scribbling down each ingredient as well as the method of cooking. In which case she missed all the ingredients to my salad. I feel it’s a little unfair to give the Cuban Bar a terrible review as I have had good times here. Once you get past the niggles described here there are some good drinks and fun to be had, although it takes some effort to find this. The Latin music and dancing has brought many bouts of laughter amongst me and my friends once the drunken masses rise to their feat, and overall the atmosphere is laidback and friendly. With a little patience, and without ordering food, the Cuban Bar can host a fairly good night out. 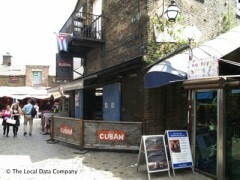 I have organised a very great night out at the Cuban, that turned out to be very successful. The bartenders and especially the bar manager made us feel welcome and it added up with a very friendly atmosphere during all night from the clientele too. Finally a place in London which is free to get in (thas right!) offers you a variety of latin music and all levels of dancers. Make sure you arrive on time, it gets pretty crowded. Drinks are a bit pricey and sometimes you do have to wait for quiete some time, but all in all a very nice place for latin lovers!